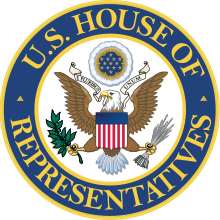 The United States House of Representatives is a part of the United States (U. S.) Congress. Congress is the legislature of the U. S. government and makes federal laws. The other part of Congress is the U. S. Senate. There are maximum 435 members in the United States House of Representatives. These members are called U. S. Representatives or just representatives. The number of representatives from each state depends on the number of people in that state, the population, but there is at least one U. S. representative from each of the 50 states. Every 10 years, the United States Census Bureau counts the population of the United States. States gain or lose Representatives based on the count. The House of Representatives is in one of the two wings in the U.S. Capitol building. The other wing is for the Senate. Sometimes the House of Representatives is informally called the House. The chairman/chairperson in the U.S. House of Representatives is called the Speaker of the House. The current Speaker is Nancy Pelosi. According to the U.S. Constitution, all bills about raising revenue, which includes taxes, must start in the House of Representatives. Also, the House of Representatives has the sole power to impeach certain officials, such as the president or federal judges. According to the U.S. Constitution, the House of Representatives can expel, or impeach, one of its representatives by a vote of at least two-thirds of its members. As of 2019, the House has 235 Democrats, 199 Republicans, and 1 Undecided seat. This page was last changed on 3 January 2019, at 18:48.